After a Catwoman centric issue, Knightmares continues here with the toted “stealth sequel” to King and Week’s hit Elmer Fudd/Batman one shot. Will this acclaimed creative team hit us with another instant classic, or will this pairing finally flounder? Grab your Line Launcher, because for this one we’ll have to go allllll the way down. We’re presented with a (mostly) silent issue that uses its visuals to convey the story. 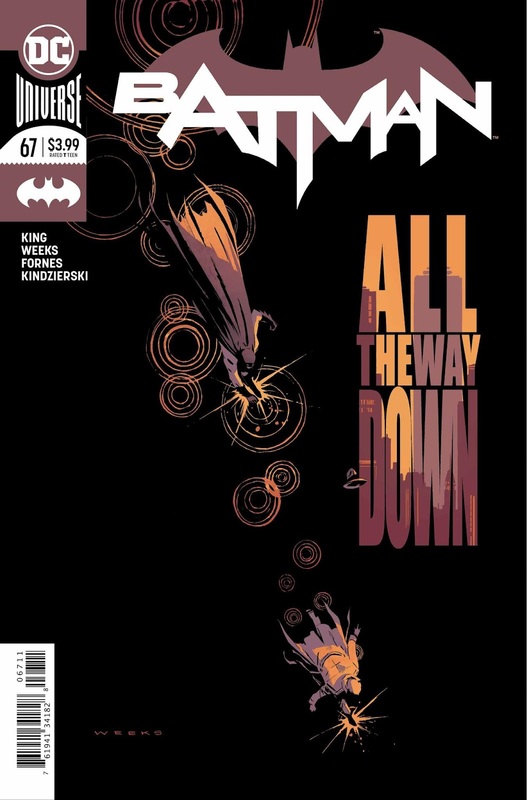 The art is kinetic and exciting, pushing a frantic pace as Batman follows a masked criminal down, down, down from the rooftops to the street below and beyond as they try to escape the Caped Crusader and the murdered body they’ve left behind. While there may not be many words to this issue, King leaves us a lot to analyze. His use of onomatopoeia is particularly interesting, and – I’ll admit – was something I completely missed upon my first read. 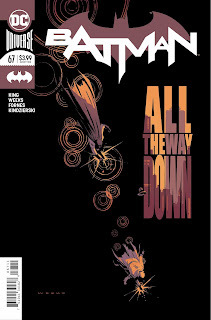 In fact, that’s the beauty of this issue – with every subsequent read, you’ll pick up something new. After I put the book down for the first time, I was disappointed. I conferred with a colleague, discussed the revelation at the end, and went back and read it a second time. Then I read it a third. Each time, the genius started to reveal itself. The murdered man is revealed to be William Ernest Coyote – a play on Wile E. Coyote. Who murdered this man? It is revealed to be the Joker, a disturbing grin painted across his face as the Dark Knight unmasks him. The parallel between the Joker and the Road Runner is one that leads to some great discussion. Usually, Wile E. Coyote is portrayed as the villain, and the Road Runner is a carefree, innocent creature that just enjoys running…So why is the Road Runner the antagonist here? What does that say about Wile E. Coyote? And, more specifically, what does that say about Batman? King uses this parallel to draw attention to the cyclical and almost comedic routine that Batman shares with his arch foe. Around and around they go, never stopping the chase. While this is quite clever, I’d like to dig a little deeper. Specifically, the use of Looney Toon characters. You could argue that this is just King going back to a bizarre pairing that became a fan favorite, but I’d argue it’s more than that. Bruce is often portrayed as not having a childhood, deprived of the normalcy that most children get to experience. He is a psychologically damaged individual, and King has repeatedly stated that Knightmares is designed to expose these shortcomings. Is King using these Looney Toon characters to show Bruce’s disassociation from his inner child? Is this his subconscious screaming for an innocence he was never allowed to have? What do you think? King and his artistic collaborators offer up a very divisive issue. On one hand, it’s a very quick read, but despite how breezy it may appear, there is a lot to unpack. This is the type of issue that showcases King’s strengths – subtle touches, thought-provoking revelations, and a deeper meaning to even the sound effects presented. If you’re ready for a bizarre dip into Batman’s thoughts, I think you’ll find this a rewarding experience. I certainly did. Great review! This makes me want to re-read the issue, and the Elmer fudd issue too! Loving the second opinions lately! I'd be interested to know how much of this story is due to the artist's input, that alone would indicate how much is due to Tom King's genius. The spoilers section of this review seems to be really reaching, King tends to stay mum on what the meaning of his writing is which lets people's imagination run wild with theories which we'll never know if he even thought about. 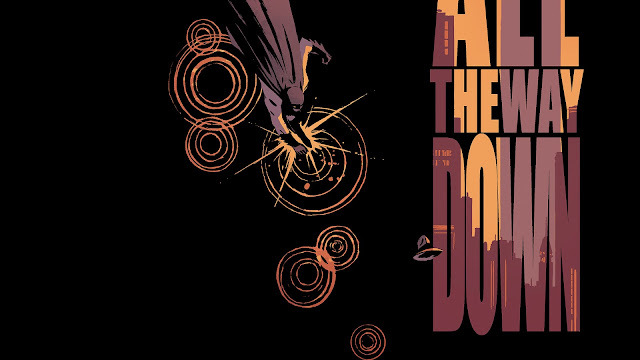 These recent issues of Batman tell us MUCH more about Tom King than they do about the character we actually pay to read about. Obviously he's struggling with the direction he wants to go with the title. . .torn between his penchant for the style of pretentious writing HE enjoys and feeling the heat from people who just want to read a goddamn Batman story. Sure, there are those who are going to read deeper meaning into these "Knightmare" issues, but it basically boils down to a mental struggle between writing "art" and writing for the popular audience. At this point, King seems almost incapable of writing a straightforward narrative because of the disconnect. The exact same mental struggle can be seen in Grant Morrison's God-Awful run on Batman. . .especially toward the end of it.